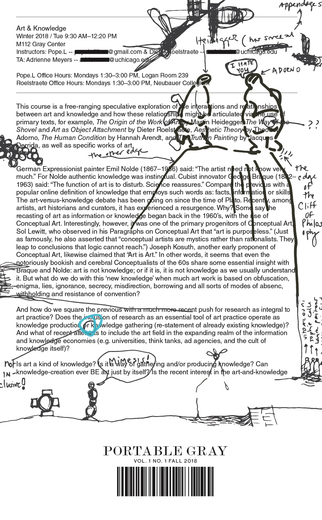 The Richard and Mary L. Gray Center for Arts and Inquiry at the University of Chicago is pleased to announce the launch of a new journal that draws on the work of the Gray Center, a research center for experimental collaborations between artists and scholars. The Portable Gray launch party will be held on Thursday, November 29, from 5:30 to 7 pm at the Gray Center Lab, 929 East 60th Street on the University of Chicago campus.Join us to meet contributors and take away a complimentary copy of the inaugural issue. Published twice annually (fall/spring) by the University of Chicago Press, Portable Gray is a forum for experimenting with two genres of publication, the scholarly journal, and the art magazine. Each issue constellates around a theme, which it treats elastically and through myriad forms: artworks, essays, interviews, reflections, photography, poetry among others. "Making Things Public: Art Magazines, Art Worlds, and the #MeToo Movement"
"Money, Land, Film, Future: in conversation"
"Imagining Futures (IF): A Survey"
Feature: What is an Artistic Practice of Human Rights? "The Virtues of Ignorance: Interview with Dieter Roelstraete and Pope.L"
"horror movie pitch and horror movie pitch 2"